Those of you willing to explore true worth of Bihar’s glorious past and cultural amalgamation can take tour of Munger which has a glorious past with promising future. This district has it’s own historic importance and wonderful cultural abundance. One can witness the great levels of it’s cultural values in the many area’s explored. From ancient times till the advent of medieval and modern era, Munger absorbed much from various quarters. with it’s rich past and a place of advanced culture, Munger still witnessed extremely rejuvenating culture of social and cultural richness. People celebrate their religious and social festival with keenness. Hindu’s, Muslims, Jain’s, Buddhist and the believers of other religions celebrate their religious festivals in complete joviality. The celebrations of Holi, Diwali, Eid and various other festivals are common and great occasions to showcase love, affection, religious, harmony and humanity. 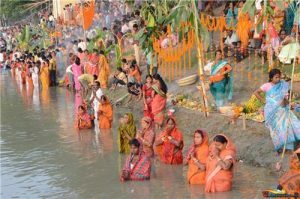 People take part in the festivals irrespective of their religious faiths. One of the most famous festivals which people celebrate in this region is Chatth puja besides many other pujas and worship held every year. Munger is a must mention destination in Bihar as it has acquired national and global stature for owning spiritual heritage and its surrounding areas. You therefore develop a feeling of holiness to explore it to best extent possible. Every portion of this district has its own story to narrate. From ancient temples to grand mosques and church you can find all and more in this part of Bihar. The feeling of cultural ambiance can be witnessed in spiritual atmosphere of Munger where Hindus, Muslims, Jains, Buddhishts and the followers of several other religions live together in harmony . Its location on the banks of sacred river Ganges makes this city religiously important . Like other parts of Bihar, people in Munger always maintain decent dressing . With its culturally rich society , Munger hasn’t been spoiled by the modern culture yet. Women can be seen wearing sarees and so are common salwar suits amongst the young girls. Boys dress shirts pants and aged men wear dhoti-kurta .Their dressing sense speaks volumes about them and especially cultural richness of the inhabitants. One can easily distinguish people from their dressing sense but at the same time it is worth nothing that they maintain unity in diversity . People lead life in peace by maintaining communal harmony. The recent past has seen some changes in the lifestyle of masses in Munger. This region welcomes many local handicrafts items production and sells in this region. Such handicrafts portray the local tradition and cultures of this region . One can see boys and girls in the urban areas swearing jeans and shirts . The majority of people in this region speak HIndi and local dialects. Speakers of English and Urdu languages are also found abundantly here.